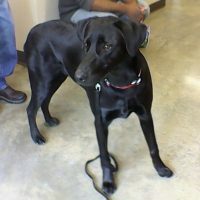 Sammy is a male black Labrador retriever who was born in July 2018. He is good with other dogs, house and crate trained. He is a certified graduate of training school, and he knows the commands “sit,” “stay,” and “down”. His previous owner had two small older doggies, and Sammy was a bit too energetic for them. Sammy needs a playmate that he can exert some energy with. If you are interested in adopting Sammy, please call Humane Society of Garland County at 501-623-5012, email garlandcountyhumane@gmail.com, or fill out an online on hsgconline.org. Please visit their website to see more wonderful dogs and cats in our care who are waiting on their forever homes.